If you mess with the pack, then the pack will mess with you. Click here to play! In the Dogfather slots, a organized crime network of Wise Mutts is stealing hydrants from all over town and putting them out on the Bark Market. They need a little human help with this operation, and that's where you come in. All breeds of dogs are needed, but none of them really get along. The Dobermans don't trust the Pugs, the Pugs don't trust the Schnauzers, and the Beagles don't trust anybody. The Dogfather is a pitbull, and he's proud to be one, but he understands when the brute force of a Doberman or the, uh, 'negotiation skills' of a Pug might be better to get the job done. 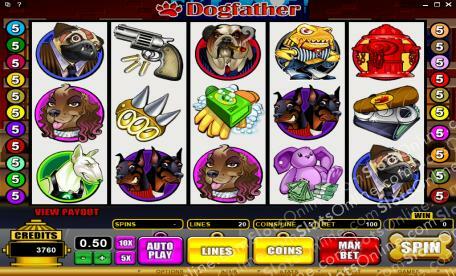 Play the Dogfather slots today and you could win a jackpot of useless human money that might buy a silly human house or noisy car. Itchy da Flea symbols are scatter symbols that pay out on the total bet and award 13 free spins when 3 or more symbols land on the reels. Wins are tripled during the free spins, except for bonus wins. The Dogfather symbol is wild and substitutes for all symbols other than scatter or bonus symbols. Red Fire Hydrant symbols trigger the Mark Your Territory Bonus when 3 or more are scattered across the reels. In this bonus, the player chooses up to 3 of the triggering symbols, each revealing a bonus prize that is then paid to the player.